Viablue SC-4 BI-WIRE CRIMPATO 150 cm - Cavo Hi End Per Diffusori (Coppia) 4x4mm². I cavi SC-4 sono intrecciati con la guaina protettiva ViaBlue ™ Cobra, la quale conferisce un estetica accattivante. E sempre ad ottimi prezzi! Viablue SC-4 BI-WIRE CRIMPATO 300 cm - Cavo Hi End Per Diffusori (Coppia) 4x4mm². I cavi SC-4 sono intrecciati con la guaina protettiva ViaBlue ™ Cobra, la quale conferisce un estetica accattivante. E sempre ad ottimi prezzi! I cavi SC-4 sono intrecciati con la guaina protettiva ViaBlue ™ Cobra, la quale conferisce un estetica accattivante. Viablue SC-4 BI-WIRE conn. banana T6S 150 cm - Cavo Hi End Per Diffusori (coppia) 4x 4mm². I cavi SC-4 sono intrecciati con la guaina protettiva ViaBlue ™ Cobra, la quale conferisce un estetica accattivante. Viablue SC-4 BI-WIRE conn. banana T6S 500 cm - Cavo Hi End Per Diffusori (coppia) 4 x 4mm². I cavi SC-4 sono intrecciati con la guaina protettiva ViaBlue ™ Cobra, la quale conferisce un estetica accattivante. Viablue SC-4 BI-WIRE conn. banana T6S 300 cm - Cavo Hi End Per Diffusori (coppia) 4 x 4mm². Viablue SC-4 BI-WIRE CRIMPATO 800 cm - Cavo Hi End Per Diffusori (Coppia) 4x4mm². I cavi SC-4 sono intrecciati con la guaina protettiva ViaBlue ™ Cobra, la quale conferisce un estetica accattivante. E sempre ad ottimi prezzi! Viablue SC-4 BI-WIRE CRIMPATO 1,5 mt - Cavo Hi End Per Diffusori (Coppia) 4x4mm². I cavi SC-4 sono intrecciati con la guaina protettiva ViaBlue ™ Cobra, la quale conferisce un estetica accattivante. E sempre ad ottimi prezzi! Viablue SC-4 BI-WIRE CRIMPATO 500 cm - Cavo Hi End Per Diffusori (Coppia) 4x4mm². I cavi SC-4 sono intrecciati con la guaina protettiva ViaBlue ™ Cobra, la quale conferisce un estetica accattivante. E sempre ad ottimi prezzi! I cavi SC-4 sono intrecciati con la guaina protettiva ViaBlue ™ Cobra, la quale conferisce un estetica accattivante. Viablue SC-4 BI-WIRE conn. banana T6S 800 cm - Cavo Hi End Per Diffusori (coppia) 4 x 4mm². I cavi SC-4 sono intrecciati con la guaina protettiva ViaBlue ™ Cobra, la quale conferisce un estetica accattivante. Viablue SC-4 BI-WIRE conn. banana T6S 1,5 mt - Cavo Hi End Per Diffusori (coppia) 4 x 4mm². La separazione spaziale dei singoli conduttori viene gestita da sistema ViaBlue ™. L'intera gamma delle diverse frequenze che è causata da un'alterazione della corrente viene ridotta, il segnale risulta ottimale, ganrantendo un suono reale e genuino. AUDIOTEKA è rivenditore Ufficiale AUDIOQUEST. (DBS, brevetto USA 7.126.055 e 7.872.195 B1). Tutti i conduttori sono solidi, che impedisce l'interazione del filo, una fonte importante di distorsione. Noise-Dissipation System: Carbon-Based Multi-Layer Noise-Dissipation and Cross-Talk-Dissipation Systems. SUPRA RONDO 4X2.5 BI-WIRE. SUPRA RONDO 4X2.5 BI-WIRE S PECIFICS. COPPIA DI CAVI SUPRA RONDO 4X BI-WIRE BLUE. Supra Rondo CombiCon 4 x 2.5 mm2 - bi-wire. High quality speaker cable with four tin plated multi-strand conductors, high pitch twisted for noise cancellation and lower inductance. The Chord Epic Super Twin speaker cable is the result of a successful marriage of two of Chord's award winning speaker cables. The Chord Epic Super Twin speaker cable's silver-plated oxygen free copper conductors, Teflon insulation and silicone surround are borrowed from Chord Odyssey speaker cable and the shielding system is taken from the Chord Signature speaker cable. This top of the range audio cable is for serious users who want the ultimate sound quality. The Profigold PGC3526 Audio Cable is suitable for connecting a wide range of stereo audio devices such as DVD & CD players with amplifiers and stereo systems. HIFI CAR LOUD SPEAKER CABLE WIRE. 50M TRANSPARENT 2X 2.5MM STRAND TOP QUALITY. Cable: 2 x 2.5mm (14 AWG). This cable is. Cable construction: 2×50/0,25 mm. The best solution for sound systems. We always try our best to resolve the issues. 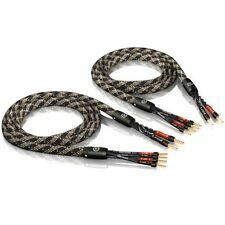 Genuine AudioQuest FLX/SLiP 14/4 bi-wire speakers cables. High end audio cables. QED XT50 BI-WIRE SPIRAL BOUND SPEAKER CABLE. 15M REEL - Loudspeaker (OFC) Audio Cable. 1 x 15m Reel of Professional Grade Speaker Cable:KÖNIG Speaker cable is a professional grade parallel speaker cable. 100's of Micro fine Pure Copper (OFC) stranded conductors, provide low resistance which enable the speaker to operate at optimum levels. Chord Epic SUPER Twin Speaker Cable. Fantastic airy non-fatiguing sounding cable. Brings out the detail but without harshness. Far superior over the standard Epic. Transparent Speaker / Loudspeaker Cable 2 x 0.50mm Squared Cross-Sectional Area Length: 20 Meters High quality Transparent loudspeaker cables are recommended for HiFi and home cinema systems. Using our cables will ensure that the complete quality of the loudspeaker system will be provided to the listener. The loudspeaker cables establish a lossless connection and ensure a placing without any problem caused be high flexibility. Musicians and technicians are using loudspeaker cables for Home-Cinema- or HiFi-systems. Each run is just under 2.4m in length. In great used condition, although the outer insulation has discoloured slightly. Ecosse reference cable for sale used condition. Technical Details Type: Speaker cable Color: transparent Cross section: 2,50mm² Inner conductor: CCA cable construction: 2x50/0,25 mm Outer diameter: 3,8 x 8,0 mm Packaging: Spool Plus-/minus marking: Yes Meter marking: Yes. FEATURES: High quality loudspeaker cables are recommended for HiFi and home cinema systems. Using that cables will ensure that the complete quality of the loudspeaker system will be provided to the listener. The loudspeaker cables establish a lossless connection and ensure a placing without any problem caused be high flexibility. Musicians and technicans are using loudspeaker cables for Home-Cinema- or HiFi-systems. The cable can be converted by yourself by cutting off the length you need. So you won´t have any cable tangle in future. AUDIOQUEST, Cavo Altoparlante RF-400, 2 x 3.5m = 7m. Tonale. Core Rame Cavo. As can be seen from the pics, this is the RF-400, Multi strand Copper core biwire cable from Audioquest of the USA. Finished in a stunning shiny blue, We have found that this and its baby brother the RF-200 are one of the most neutral sounding cables we have sold. Type: Speaker cable. Color: Transparent. We always try our best to resolve the issues. Cable construction: 2×25/0,16 mm. Cross section: 0,50mm². Plus-/minus marking: Yes. Monster Cable Original Speaker Cable OMC MKII-500 High Resolution Speaker Wire 50 0ft. Monster speaker cables are examples of such products. Monster Cable® OMC - This is the original Monster cable! 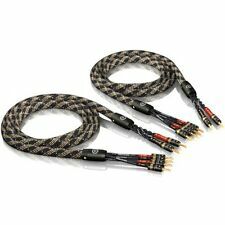 Cambridge Audio Inovation Bi-wire Speaker Cable 2 x 1,55 m long. In excellent used condition, each run is 3.25m in length.